ChinaSF is honored to host a one-day program with the China Council for the Promotion of International Trade (CCPIT) and the China Chamber of International Commerce (CCOIC) for a panel discussion and intimate networking sessions with industry leaders from China and the Bay Area life sciences industries. Join us to meet industry experts from China and San Francisco’s life science and biotech industry and gain on-the-ground insights into the local life sciences community. ChinaSF, in partnership with the Ningbo Municipal Development and Reform Commission, presents a training program on the future of the cleantech industry exploring clean technology application and policy, clean transportation, business development in the clean technology industry, clean energy investment, energy efficiency, and renewable energ. ChinaSF Roadshows are the perfect opportunity to understand the nuances of both inbound and outbound investment and business as it relates to the Chinese market. Attendees have access to forums, networking with Chinese institutional investors, site visits, and more in each city as well as other fun and exciting events and activities. GlobalSF, through its regional initiatives, is able to host many engaging events such as our Roadshows. Our Roadshows provide companies with the opportunity to leverage our global network to explore new and exciting markets. Companies have the ability to meet foreign companies while introducing their own company on the global stage. Celebrate Chinese New Year with ChinaSF. Join us and our global network to ring in a prosperous and healthy new year. Invitation upon request. Please contact chinasf@globalsf.biz for information. ChinaSF is partnering with the California State Government and the San Francisco Mayor’s Office to bring ten mayors from China’s G40 cities to participate in the 2018 Global Climate Action Summit. After a successful first year, ChinaSF will partner with the Chinese Council for the Promotion of International Trade (CCPIT), a second time, to host Chinese delegates from the BIO International Convention. The delegates will meet with professionals in San Francisco to generate greater cooperation within San Francisco’s life sciences industry. ChinaSF and the Chinese Technology Administration are co-hosting the 2018 InnoSTARS Competition. The InnoSTARS Competition is a national-level platform designed to connect U.S.-based innovators with Chinese investors and corporate partners. The Applied Artificial Intelligence Conference is a must-attend event for people who are working, researching, building, and investing in Applied Artificial Intelligence technologies and products. 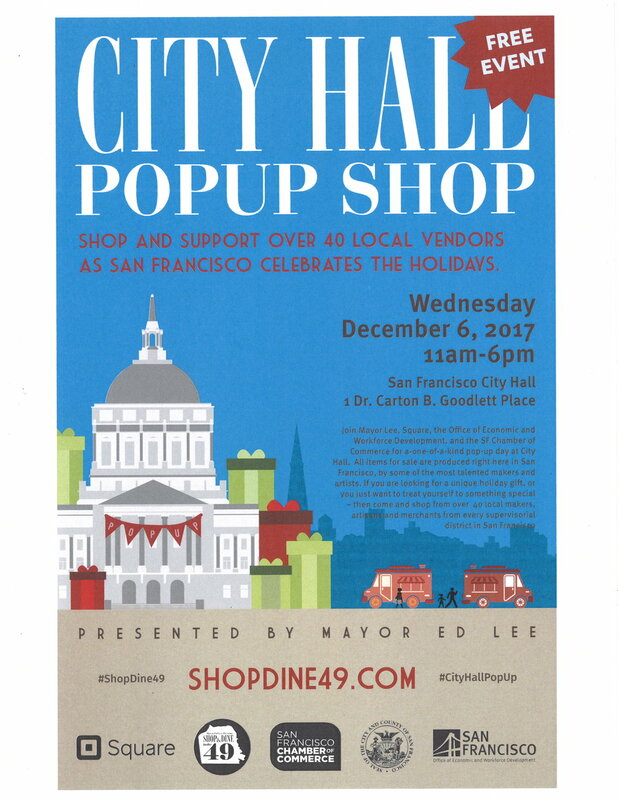 Join Mayor Lee, Square, the Office of Economic and Workforce Development, and the SF Chamber of Commerce for a-one-of-a-kind pop-up day at City Hall. All items for sale are produced right here in San Francisco, by some of the most talented makers and artists. If you are looking for a unique holiday gift, or you just want to treat yourself to something special – then come and shop from over 40 local makers, artisans and merchants from every supervisorial district in San Francisco. Asia Society and the Bay Area Council are organizing a conference that will look at the trends and issues in the emerging narratives around Chinese innovation and China’s rise as a significant source of foreign direct investment into the U.S. Building on both organizations’ growing portfolio of reports and dialogues on these issues, the conference will serve as the backdrop for the release of two reports: the first of which will explore China’s drive for innovation and the second report which will provide a comprehensive look at China’s investment into California. Join us and be a part of the conversation with California's large and growing community of businesses, investors, and service providers across a broad range of industries (e.g. ICT, real estate, healthcare, etc.) eager to seize on the opportunities coming from China, as well as public sector leaders from the state- to city-levels, business associations, academia, and the general public. Following a very successful 1.0 in September 2016, attendees and delegates want more! In September, ChinaSF will have an event focused on the in's and out's of the Bay Area's infrastructure industry. What are the opportunities , who are the players, what does a public private partnership (P3) look like? The current administration says yes, China wants in. ChinaSF invites you to a seminar with the experts for a discussion on these topics. Join ChinaSF and BPM for an educational presentation on tax reform plans and unveil the advantages of the Research and Development (R&D) Tax Credit. During this program, we will discuss the favorable benefits of the updated regulations, the vast opportunities in the various industries, and how to maximize the benefit of claiming the R&D Tax Credit. To welcome delegates en-route to 2017 BIO International Convention in San Diego, ChinaSF will host a one day program to introduce San Francisco's fastest growing industry - health care/life sciences/ biotech. With China showing its readiness to invest and acquire, this program aims to provide networking opportunities that will lead to funding start-ups, programs in clinical trials, those ready to go to market and many more. Come join us for HardwareCon! Hardware Massive is presenting a two day conference focused exclusively for hardware startup entrepreneurs. This conference & convention is designed to help founders catapult their business to the next level of success. Enjoy a variety of Keynotes, Panel Talks, an Exhibition Hall, various breakout sessions, retailer 1 on 1's, Hardware Blvd, a Pitch Contest, and Robot Lunch! Join ChinaSF, Asia Society, and Huawei for a candid conversation on the future of the US - China trade relationship. This frank conversation will feature James Lockett, Vice President, Head of Trade Facilitation and Market Access at Huawei. The current political climate's implications for the economic relationship - particularly in trade and commerce - between China and the U.S. If it will be business as usual, or are we entering an era of real uncertainty between the world’s two largest economies? In May, ChinaSF and BPM are looking forward to hosting an event for research and development tax credits. Come join us at FinTech in China! FinTech Silicon Valley has partnered with the global chamber of Commerce and China Entrepreneurial Club to host a panel of investors and founders who will discuss FinTech's focus in China. ChinaSF Annual Fundraiser & Grand Opening Gala of China Live! Join us in welcoming San Francisco's newest culinary and cultural destination, China Live! Enjoy authentic gourmet dishes while celebrating with drinks, lion dancing, and firecrackers. China Live San Francisco is the city's new and exciting epicurean destination, providing unprecedented access to Chinese cuisine. To purchase tickets, please visit the Eventbrite. Note: 80 percent of the price of this ticket is tax-deductible; 20 percent is attributable to event costs. Co-organized by ChinaSF, Asia Society Northern California and World Affairs will host a dialogue with The Honorable Kevin Rudd, President of the Asia Society Policy Institute and former Prime Minister of Australia, who will look at some of the critical issues facing the Asia-Pacific region today and the challenges likely to emerge in the coming years. Please purchase tickets here. To attend for free, please select "ChinaSF Guest" as your ticket option. Come join us at this ChinaSF co-hosted event for a night of traditional Chengdu entertainment and Chinese cuisine prepared by renowned chef Martin Yan! Join us for our first annual ChinaSF Builds Roadshow! Including forums and panel speeches discussing relevant topics in cross-border real estate investment, such as the state of the San Francisco & Chinese real estate markets, insights on ground-up development, tax and legal issues, and more. Attendees will include delegates from top-level Chinese real estate developers. For more information, please contact us at chinasf@sfced.org. Want to know the latest news out of Sacramento? Then join the Chamber for lunch with Assemblymember David Chiu on August 12, 2016. David Chiu was elected to the 17th Assembly District in November 2014. The district encompasses the eastern side of San Francisco. David serves as the Chair of the Assembly Housing & Community Development Committee and sits on the following legislative committees: Budget, Judiciary, Local Government, and Health. Before joining the State Assembly, he served as President of the San Francisco Board of Supervisors for six years. We invite you to join us and remember: Lunch is free thanks to our generous sponsors Ladle and Leaf and Halo Fine Confections. Join ChinaSF, the San Francisco Chamber of Commerce, and Indeed for this Small Business University offering networking and a look at "San Francisco: A Labor Market in Transition." Join us August 9 as the CEO of the California Earthquake Authority, Glenn Pomeroy, presents on the importance of being prepared for an earthquake. He will speak to the potential economic consequences of a significant earthquake and a community's ability to recover. In addition, he will share exciting new programs and initiatives the organization launched this year to make earthquake insurance more accessible and help homeowners mitigate potential earthquake damage. Glenn Pomeroy has been CEA's CEO since 2008, and has led bipartisan legislative efforts at a both the state and federal level to reduce the cost of earthquake insurance. While at CEA, Glenn has led the organization's efforts to lower its rates and provide more choices for consumers regarding policy options. As part of CEA's strategic plan to Educate, Mitigate and Insure, Glenn has been crisscrossing the state this year to discuss the new options now available from the non-profit California Earthquake Authority - the largest earthquake insurance provider in the United States, and one of the largest in the world. Forum on Chinese tech business at Stanford University. Confirmed speakers include Logan Allin, Partner of Formation Group; Elliot Donnelley, Chairman of White Sand Group, and several Chinese CEOs. The other panel is a fireside chat with either Hans Tung of GGV or Gideon Yu, former CFO of YouTube and Facebook. The Department of Labor finalized new regulations that will significantly affect businesses of all sizes and across all industries. Sign up for the forum and learn from the experts what the new federal overtime regulations meant to your business, and how to prepare for the new standards. The U.S. Labor Department finalized new regulations that will significantly affect businesses of all sizes and across all industries. Sign up for the forum and learn what the new federal overtime regulations mean to your business and how to prepare for the new workplace standards. Partner Orientation is our monthly orientation for current partners, new partners and prospective partners. Offers an overview of the Chamber, programs and events, public policy initiatives and activities, sponsorship opportunities, immediate networking, and ways to get connected. Please arrive promptly, program begins at 3:30 pm. Join the San Francisco Chamber of Commerce and SF Travel for an evening of networking at SPiN, located in SOMA at 690 Folsom Street.